Image. Selection from Travel Explorations` Pinterest page. © Travel Explorations. It`s our new exhibition window. For us Pinterest is like a continuously growing online brochure of inspiring photos from exciting journeys around the world. We consider this media as a great tool for exploring the world. By going through our boards and photos, travellers can find and explore places they really want to visit. Then they can start planning their tours. As written in an article on Examiner.no (5th July 2012): "For travel planning, especially at the dreaming stage, Pinterest’s rich, visual platform offers an exciting view of national and global destinations." Pinterest is the third, most popular, social media site in the world, behind only Facebook and Twitter, according to researcher Experian Hitwise’s new analysis, The 2012 Digital Marketer: Benchmark and Trend Report, as well as data on Black Box Social Media’s newly released Pinterest Infographic. Watch our Pinterest page here. When travellers find inspiration on our Pinterest page, we will attract them to our global travel guide Travel Explorations. 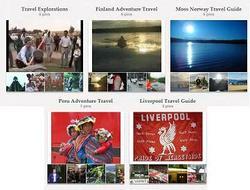 There they will search for more information and book their tour through our associated tour operators.